With screen-time increasing, it’s time to ask some important questions around the way screen addiction could impact our future workforce, say Stephen Smith. In 2014 app developer Kevin Holesh moved in with his fiancée. After a hard day at work they would settle down on their couch, smart phones in hand, and lose themselves for a while. Initially, this gave them a chance to unwind, to relax, and drown in the ludic joy of the screen’s calming glow. However, it also took up precious time. Kevin realized that less and less of their spare time was spent in productive leisure, or even doing something exciting, but instead simply fixated on the screen. After living in distraction for six months, Kevin realized that there was a problem and that he was ‘addicted’ to his phone. So he decided to come up with a solution in a way only he knew how. He was going to design a mobile app to combat his addiction to the mobile phone. The app eventually became Moment. Moment is a tracker of mobile phone use. It sits silently on your phone, discreetly tracking your phone use and totting up the hours you’ve spent and the activities you’ve carried out on the device. When he started he found that he was using his phone for approximately 75 minutes every day. Now, he’s limited that to just 45 minutes a day. This app is now available on iOS and Android and comes with a bunch of paid-for features that can help you limit this neurological time-drain. In early 2017 Adam Alter, Associate Professor at New York University’s Stern School of Business, released his book Irresistible: The Rise of Addictive Technology and the Business of Keeping Us Hooked. His work aimed to expose the underlying psychological and behavioral triggers that have seen mobile phone use and on-screen time increase (now, on average, Americans spend 10 hours and 39 minutes each day across all screens ). A couple of years ago Adam realized that he was spending too much time on his phone, and was looking for a way to limit it. He could see the impact it was having on his life and how much time was being eaten up by it. So, searching around one day, he found Moment. Tracked across thousands of Moment users, a picture of our technological addiction, and its increased prevalence, begins to build up. Two years ago, the average time spent on mobile phones was 2 hours and 48 minutes. In 2017 this rose to a whopping 3 hours and 42 minutes. That’s nearly 4 hours in every 24. 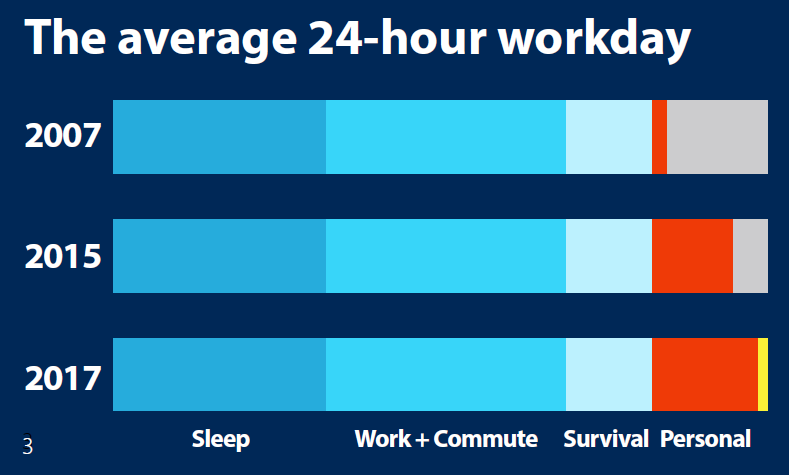 This chart, taken from his recent Ted Talk, shows the estimates of how much time is taken up doing things across the average 24 hour day. In this case, not only is it an activity that takes up is characterized by brain reward, but it’s damaging the relationships we have with people. Indeed, his main concern is a social one, that more and more screen-time will lead to isolation, an inability to adequately interact socially, and ultimately depression. In fact, Adam’s research shows that we spend an average of 9 minutes per day on healthy, constructive apps that enrich us. However, he warns, 27 minutes per day is taken up on the types of damaging apps that cause fear, isolation and depression, like social media and news sites. Research over a 10 year period by Natasha Dow Schüll, a cultural anthropologist from MIT, into highly addictive Las Vegas slot machines discovered that people enjoyed the game despite the low chance of success and repetitive nature of the activity. In fact, she discovered, heavy users were actually disappointed to win, precisely because it broke the repetitiveness of the game . She called the lulling, dream-like state of pleasure aroused by these types of games a ‘ludic loop’. The loop in question being the pathway, littered with small rewards, that gently nudges you to pull a lever here, a button there, but always with the view to keep you playing. We’ve probably all played these games at one time or another and found ourselves looking up at the clock to notice another thirty minutes has gone by. But it’s not just games that utilize the ludic loop formula. The entire design paradigm of our mobile phones encompasses this exact type of thinking. Common ludic loops are those time-wasting activities that go unnoticed. I might check Facebook for instance, and then once I’ve had my fill, close that app and move on to Instagram. From there, I might go to Twitter and then after that, refresh my email and see if anything has popped up there. Once I’ve completed one loop, I might head back to Facebook and do it all again. The type of design that enables this unconscious looping is the part of the reason why we can spend upwards of 4 hours every day on their mobile phones. Take Facebook. The newsfeed is designed to keep throwing out more and more material. To keep you engaged at all times. So too with online newspapers, particularly live-feeds on political or sporting events. And again with modern streaming services, such as Netflix. They now have technology in-built to play the next episode of the series, or related shows or films so that you never have to think, you just sit back and let Netflix take you on a journey. Some have spoken about IAD (Internet Addiction Disorder) . 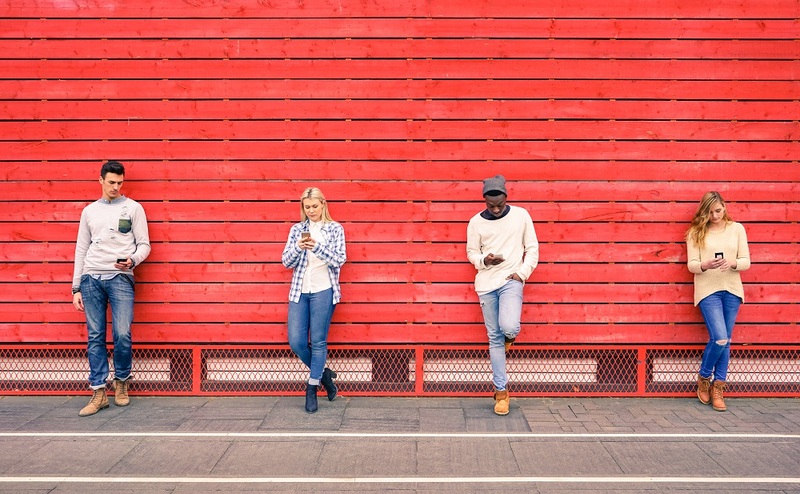 Studies into this disorder show that the brain has responded to our internet use in ways that are similar to other addictions. For businesses, understanding the impacts of this societal change and how the younger workforce will be affected by this addiction will be vital. Cardinus have already highlighted how your future workforces will be afflicted by the physical effects of mobile phone use, in previous articles like Generation Pain and Ergonomics Tsunami. We have also spent a lot time putting free resources for parents and young people, including a website, app and downloadable PDFs. But very little time and effort in our industry has been spent on the psychological impacts of smart phone use. Understandably, we’ve shied away from discussing it as less is known about the future impacts. Indeed, as Krubitzer points out, it could all be fine and we’re fretting about nothing. But what we do know is that the brain adapts to the stimuli it is given, and if that’s almost entirely screen-based, then that’s something that has never happened before. The fallout could be dramatic. From Adam Atler’s point of view, he’s worried about the social impacts of this change. That young people may not be getting the right kind of face-to-face stimulus required for cultivating and retaining meaningful relationships. He goes as far as to suggest that, in years hence, we might view it with the same kind of health risk as smoking, suggesting that it could eventually become a regulated resource. I was astounded that I used my phone that much. I don’t even recall using it for any length of time, and I didn’t even ring anybody yesterday, so that is all app-based usage. My aim is to bring it down to 40 minutes per day, but I have no idea how!